Now a Sandia-led team has created a plasmonic, or plasma-containing, crystal that is tunable. The effect is achieved by adjusting a voltage applied to the plasma. Because the crystal then is agile in transmitting terahertz light at varying frequencies, it could increase the bandwidth of high-speed communication networks and generally enhance high-speed electronics. 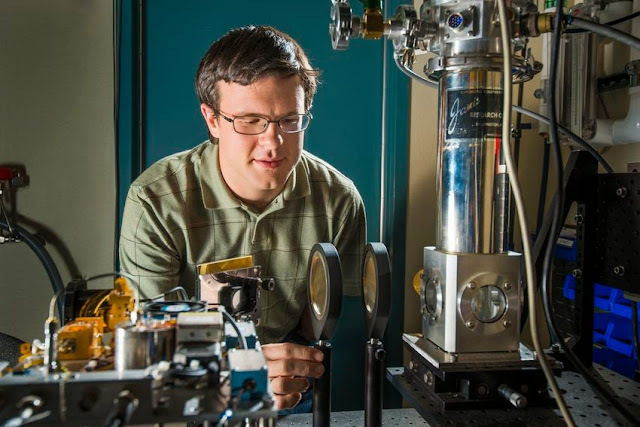 "Our experiment is more than a curiosity precisely because our plasma resonances are widely tunable," says Sandia researcher Greg Dyer, co-primary investigator of a recently published online paper in Nature Photonics, expected in print in November. "Usually, electromagnetically induced transparencies in more widely known systems like atomic gases, photonic crystals and metamaterials require tuning a laser's frequencies to match a physical system. Here, we tune our system to match the radiation source. It's inverting the problem, in a sense." Photonic crystals are artificially built to allow transmission of specific wavelengths. Metamaterials require micron- or nano-sized bumps to tailor interactions between manmade structures and light. The plasmonic crystal, with its ability to direct light like a photonic crystal, along with its sub-wavelength, metamaterial-like size, in effect hybridizes the two concepts. Its methods could be used to shrink the size of photonic crystals and to develop tunable metamaterials. The crystal's electron plasma forms naturally at the interface of semiconductors with different band gaps. It sloshes between their atomically smooth boundaries that, properly aligned, form a crystal. Patterned metal electrodes allow its properties to be reconfigured, altering its light transmission range. In addition, defects intentionally mixed into the electron fluid allow light to be transmitted where the crystal is normally opaque. However, this crystal won't be coveted for the beauty of its light. First, the crystal transmits in the terahertz spectrum, a frequency range invisible to the human eye. And scientists must tweak the crystal's two-dimensional electron gas to electronically vary its output frequencies, something casual crystal buyers probably won't be able to do. The paper is titled "Induced transparency by coupling of Tamm and defect states in tunable terahertz plasmonic crystals."